Water is getting scarce. Many parts of the earth, including the mighty California is facing droughts. It is becoming highly imperative that we understand the importance of water and ways for water conservation. And that, begins at home. 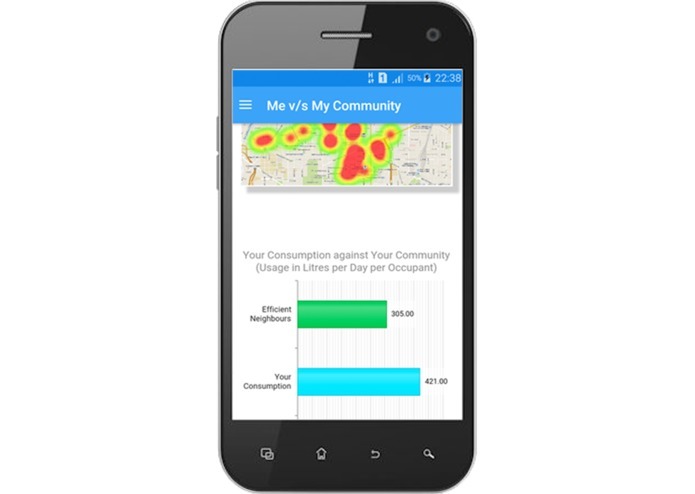 We can monitor our daily water usage and gain analytics on our consumption patterns & for any leakages. Powered by such insights, we can find avenues to conserve water and eliminate water wastage. 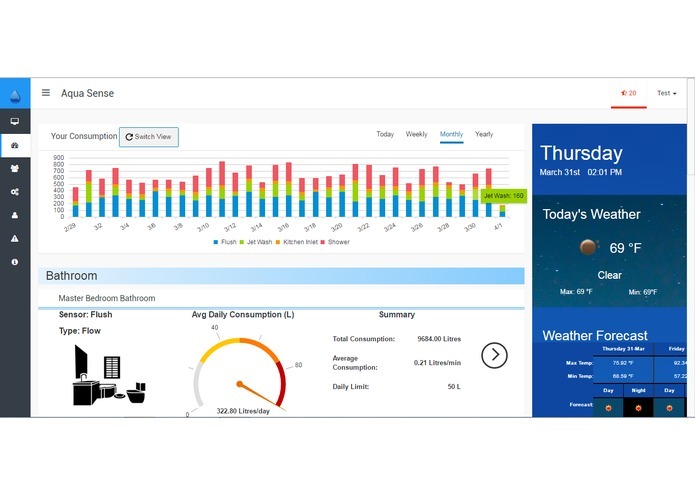 With the advancement of IoT devices, it is now possible to gather data at the minute level and leverage it for data analytics. However, to install & configure such devices requires expertise, which at times puts off the users. We feel that a solution to monitor household water consumption, which can be easily setup and used by users is key for adoption of such solutions. And so, with these goals on our vision, we present Aqua Sense. Your Home Water Consumption Monitoring - Simplified! 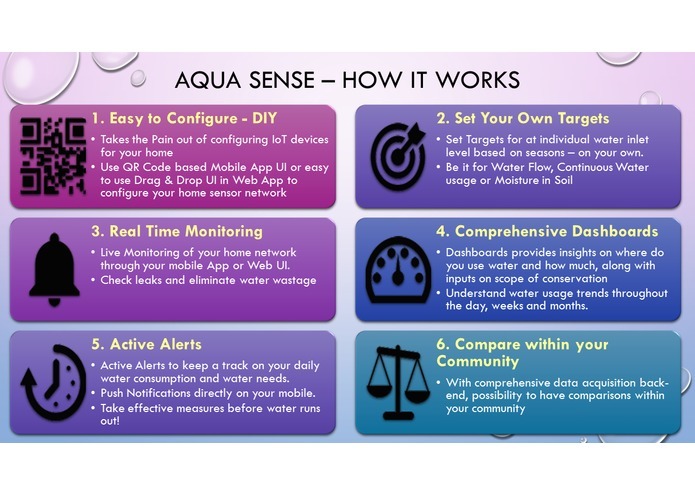 Aqua Sense is your own DIY Water Consumption Monitoring SCADA system for your home. Through state of the art technologies, it captures your water consumption details at each and every water inlet/outlet, as well as moisture content in soil and also detects water flow & leakages. 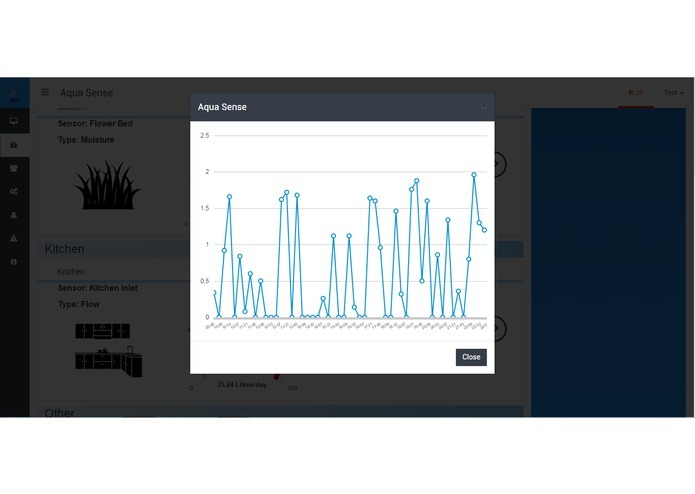 Using the captured details, Aqua Sense provides insights on your water consumption patterns, which can be leveraged to find avenues to conserve water. It also provides proactive alerts when you exceed your daily limits, which you yourself can configure, right on your mobile through push based notifications. Takes the Pain out of configuring IoT devices for your home. 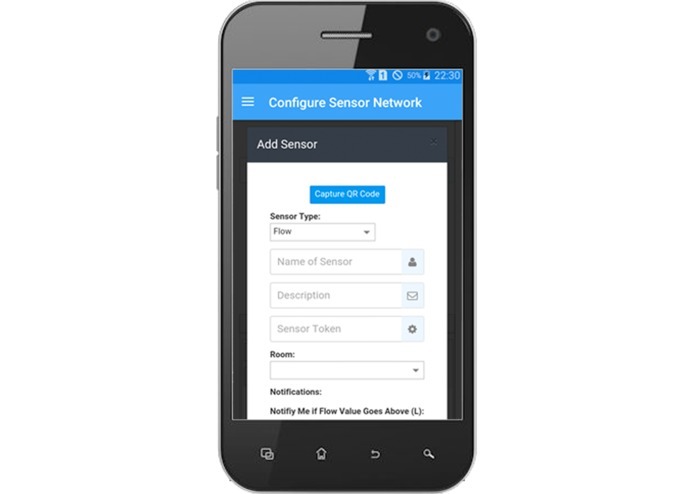 Sensor network can be configured easily through Mobile App, using QR Codes, or through a flexible drag n drop based Web App UI. Get Active Alerts to keep a track on your daily water consumption and water needs. Take effective measures before water runs out! Comprehensive dashboards provides insights on where do you use water and how much, along with inputs on scope of conservation. In-built scientific calculations to generate your water consumption details from flow rate, detect moisture content and also detect whether water is flowing through the network. Flow - Measures the Water Flow in Litres / Min and thereby used to calculate the Water consumption in Litres. Hall effect Flow Sensors used to measure the water flow and needs to be inserted between the water pipes. Ultrasonic Flow Meters can be used for non-invasive method to measure flow wherein the existing pipes need not be disturbed. Flow Detector - Detects whether any Water Flowing inside the pipe. Piezo Sensors are used which detect vibrations resulting from flowing water. Moisture - Measures Moisture as water content in % in soil. Probe based moisture sensors are used to detect the volumetric water content in soil. 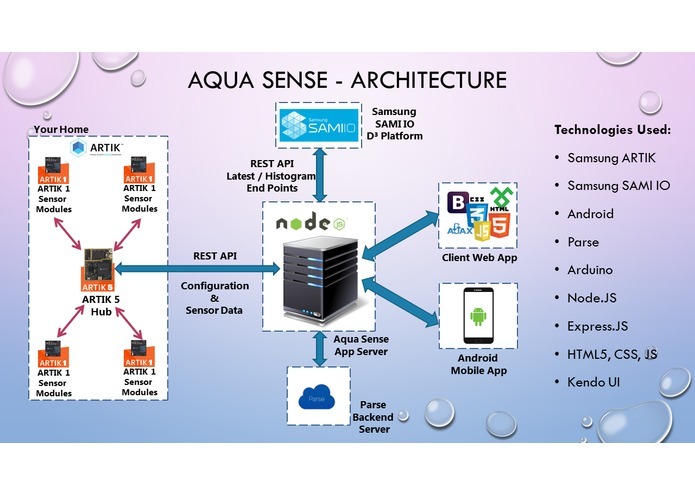 IoT devices powered by Samsung Artik, Cloud Data back-end powered by Samsung SAMI, Web Portal powered by Node.JS & Parse and Android Mobile App comes together to build something awesome - Aqua Sense. For the proposed architecture, an Artik 5 powered Hub is at the centre of the implementation, which is responsible to collect data from Artik 1 based sensors using Bluetooth and transmit to Samsung SAMI platform. For the prototype that we have built, we are using Artik 5, powered by Arduino code, which itself receives configuration data from Aqua Sense Server, and then collects data from the sensors and transmits to Samsung SAMI, via the Aqua Sense server and also manages the Push based notifications when users exceeds the set Targets. 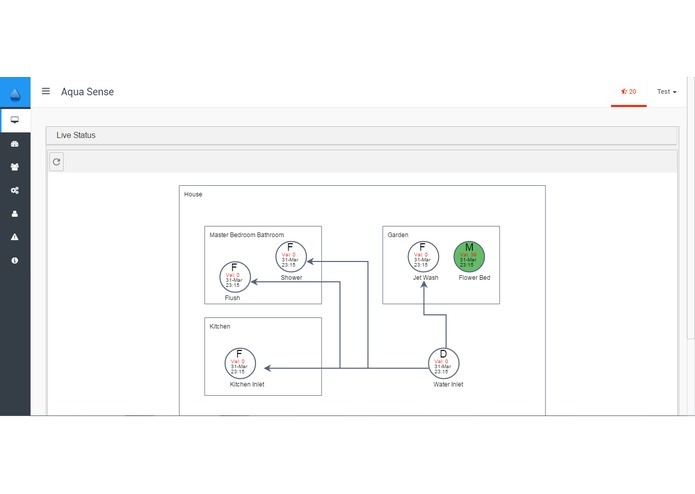 The current implementation requires Aqua Sense Master User to create devices in the SAMI portal and the device Id and device tokens shall be embedded into each of the sensor modules. 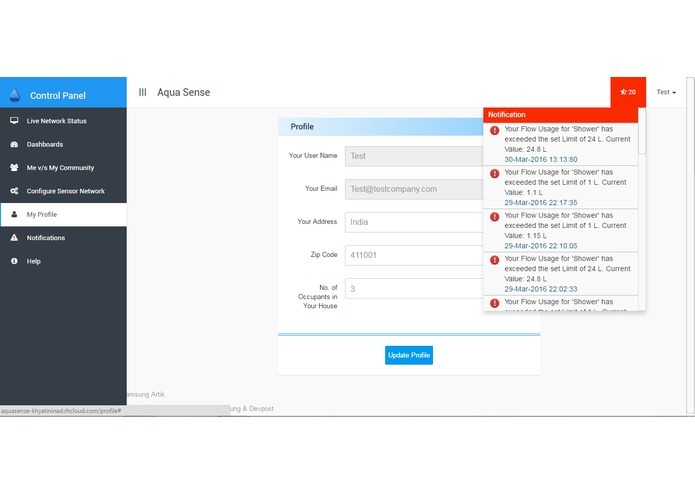 This ensures Aqua Sense has access to data for analytics and also does not require user to create accounts with SAMI. However, a future implementation can be linked to user accounts with SAMI. 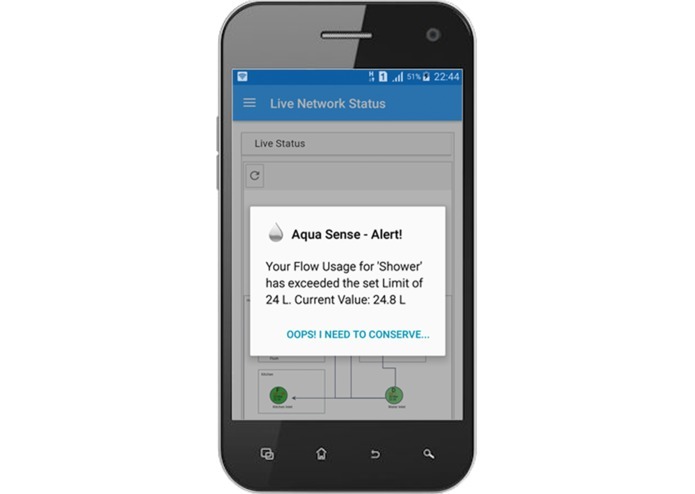 Aqua Sense provides a Web Application as well as an Android App to configure the network. This can be done easily through scanning QR codes on the devices using mobile app and through drag-drop functionality for the entire network map. 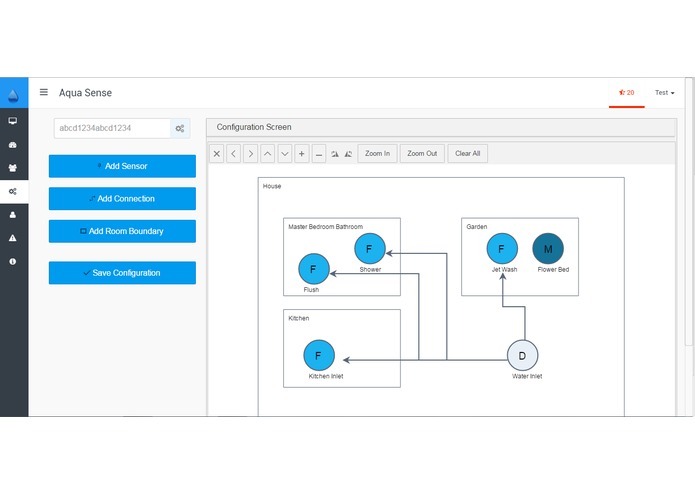 Once configured, the devices can hook up to the Aqua Sense servers to receive their configuration and behave accordingly, to collect & transmit data as well as generate Alerts. Alerts are received as Push Notifications on Android devices as well as through rich UI in the Web Portal. User can view the live status, dashboards & reports through their Android App as well as Web Portal. 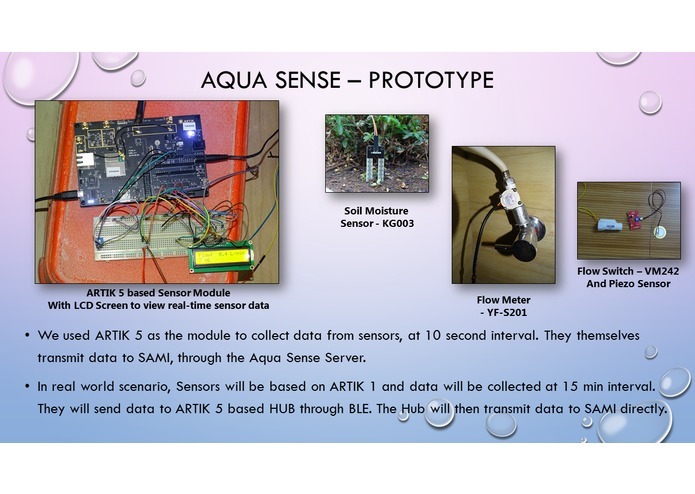 The prototype currently does not use the hub and is based on Artik 5, and each of Sensor Artik's directly communicate with Samsung SAMI via the Aqua Sense Website and Aqua Sense back-end to get the configuration and transit the sensor data. It was a great learning experience to try out the Artik Kit and build robust IoT applications using the same. We used Arduino in order to code for Artik, wherein we faced initial issues while connecting to HTTPS sites. Artik Support was superb in helping out resolving the issues. We have built an entirely working prototype, including code for Artik, which sends data to SAMI IO successfully. The configuration of network can be done by mobile or web app and actual data dashboards, reading histogram data from SAMI are also visible in mobile & web app. Plumbing! That's on a lighter note. However, we learnt a lot about the IoT platform and how it can impact our day to day lives. We also got a chance to work with Artik 5 and make a working prototype and a fully functional mobile & Web App. Prototype currently have individual sensors sending data to Samsung SAMI. With multiple Artik 1 based sensors, create a network of Sensors which can talk to a Artik 5 based Hub, which transmits data to SAMI.